When one customer wanted Walmart to make him a Confederate flag themed cake, his request was denied. After being denied, the customer, YouTube user Chuck Netzhammer, decided that he would make a much more controversial request. 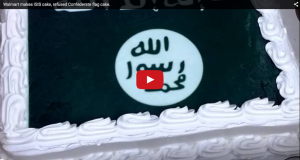 He asked Walmart to make him a cake with the ISIS terrorist flag on it.